Every kitchen needs a few basic items to be functional. Besides the obvious stove and refrigerator, you need knives, a cutting board, a few pots and pans, some dishes. Then there are the things you don’t need in a physical sense, and yet still you find them absolutely necessary. Whenever I find myself cooking in someone else’s kitchen, I always find something missing that I was sure no one could live without; for me this is a small non-stick sauté pan. I never knew how strongly I felt about this particular item until last year. We were renting from a nice couple in San Francisco for the summer in a house in the Lower Haight. They had a lovely kitchen that seemed to be well stocked and everything seemed to be going well, until on the first weekend while preparing to scramble some eggs, I discovered the unfortunate condition of their non-stick pan. At the risk of hyperbole, it looked as though it might have crossed paths with a lawnmower. It was scratched and rusting and clearly its non-stickiness had come to an end. You may be reading this right now and thinking, “I seem to recall a few of my pans looking a little like that.” Yes, you know who you are, you abusers of Teflon products. You used a metal spatula, a fork, a steak knife, or a chainsaw to flip your omelet and stir your veggies. Redeem yourself now by taking all of your rusty, abused pans and throwing them out. If you feel bad about tossing them, donate them to an organization like Goodwill or the Salvation Army. And if you’re looking at them and wondering if they’re too damaged to donate, see option No. 1. Then head on out to your favorite home store and pick up a few new pans; you can get something decent starting at $10. While you’re at it, get yourself a new spatula. You may be wondering how I enduring the pain and frustration of not having My Stuff to cook with. Well, I just marched myself to Bed Bath and Beyond and bought a pan (and a spatula) and then took it home with me at the end of the summer (it's my favorite pan now). Don’t get me wrong, I’m not happy about having to do this; I don’t want to be at the beck and call of my control issues. I wish I could just be happy with what was already in these foreign kitchens. I’ve tried to work out my problems with other people’s stuff, but nothing seems to help. My Stuff is just so damn fantastic. Since we’ve been on vacation I went three whole days with the lumbering, oversized skillet in our studio that is only slightly worse for wear. The real problem: it’s not the right size. How can you cook an omelet in a pan that big? Eggs are delicate and have to be treated with respect—you can’t just throw them in any old pan you find. 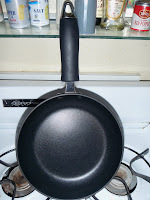 I finally broke down and went to K-Mart, where I bought the perfect pan for just 10 bucks, and I feel so much better. Now I know I just need to start taking it with me wherever I go—I just wish it didn’t have to be this way.